Iowa Car Insurance Requirements | Hupy and Abraham, S.C.
How Much Auto Insurance Is Required in Iowa? 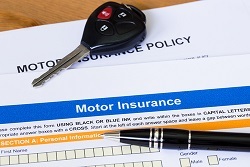 Unlike most states, Iowa does not have a compulsory auto insurance law. Instead, a driver must be able to prove financial responsibility in the event of an accident. Showing that you have Iowa motor vehicle insurance. Posting a bond with the Iowa Office of Driver Services. Obtaining a legal release from liability from any other parties involved in the Iowa car accident. Being found completely not liable after a civil suit. Agreeing to pay the injured parties’ damages through an installment plan. Executing a warrant for confession of judgment that promises to pay the other parties’ damages on an installment plan. Filing written evidence of complete settlement of all damages. While these options exist, you should still consider buying car insurance. $25,000 for the injury or death of a single person. $40,000 for the total damages caused by an accident. $15,000 for coverage of property damage. This coverage is the minimum required by Iowa law, but carrying additional insurance may be a good idea. If you are found liable for an Iowa car crash and the damages exceed the limits your policy, you may have to pay the difference from your own assets. Since car insurance is not required in Iowa, it is important to protect yourself from uninsured and underinsured drivers. If you are in an accident with an uninsured or underinsured driver who cannot afford to pay for your injuries, then you may be stuck with the bills unless you have uninsured or underinsured motorist coverage through your own insurance company. While Iowa law does not require you to purchase this insurance, the law does require you to purchase a minimum of $20,000 per person or $40,000 per accident if you decide to purchase uninsured or underinsured motorist coverage. Before you renew your auto insurance, we encourage you to browse our website for more tips and resources for drivers and to read a free copy of our report, Understanding Auto Insurance.